NEW! How to Register: You can now register anytime in classes where there is room! Our gym school season now runs from September until the end of June and you can pay monthly or in full! You do not need to re-register again for each term.Summer Classes is a separate registration.Read our updated policies here before registering. You may cancel at any time with only 2 weeks notice! To login to your parent portal click here. To create a new account click Register beside the first class of your choice. Jumping on a trampoline is one of the healthiest forms of exercise there is but requires a CERTIFIED COACH not a supervisor to keep your child safe! WARNING: We do not advise participation in any trampoline parks that are supervise only centres. It is a fun low-impact workout that improves body and spacial awareness, co ordination and stability. It also provides numerous cardiovascular and other health benefits. It strengthens the core stomach and back muscles, legs and thighs, while boosting the immune and lymphatic system. Most of all, trampoline is super FUN! 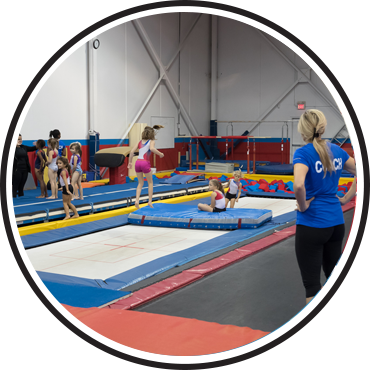 Our program teaches the fundamental basics of trampoline, while advancing those who are ready to do more complex skills. The primary objective is fun and fitness in a safe, copntroled environment! This program is based on the CANJUMP Level System and focuses on safety, basic through to advanced skills, correct technique and improving participants’ level of fitness. Testing is conducted 4x per year, including summer. Registrants must be enrolled a minimum of 8-10 weeks to be evaluated otherwise they will receive a progress report. 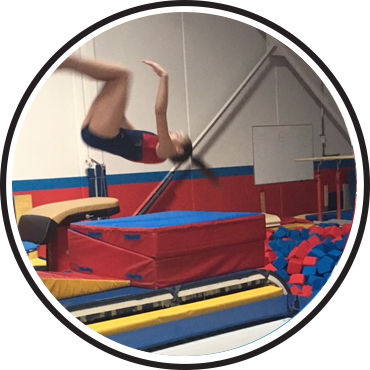 Our 2 in ground Olympic size trampolines and in ground tumble track aid in learning proper progressions and contribute to the safety of all participants. The custom trampoline area has a specialized resi-pit and huge covered foam pits, complete with an overhead bungie system. Our foam is covered and is hypo-allergenic with the highest possible standard keeping your child’s lungs free of dangerous chemical dust! Come Defy Gravity with Us! Everybody loves to bounce! This introductory level class is designed to teach trampoline safety and the basics of jumping on the trampoline. Participants will learn to jump properly, various trampoline shapes, body positions, control, landing, stopping and combinations. Great exercise without even knowing it and of course tons of fun! $35.00 per Person Membership Fee July 1, 2019 – June 30th, 2020 will apply. 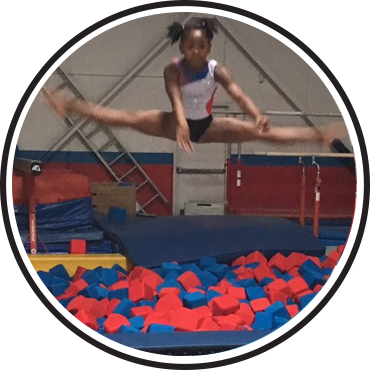 This trampoline class progresses trampoline skills beyond basic jumping, works on combinations/routines and prepares participants for inversions (flips). They will work at their own individual level of ability on the intermediate levels of the CAN JUMP National Trampoline Level System. Great fun! Great fitness and superb fundamentals for any sport. An advanced trampoline class where flips are taught correctly and perfected to the best of each one’s ability! Safety is number one! Spotting belts and mats are often used to aid in skill development of front and back single flips. Twisting techniques are also introduced when participants are ready. Conditioning and free time is thrown in the mix to make it an all-around great time at the gym.